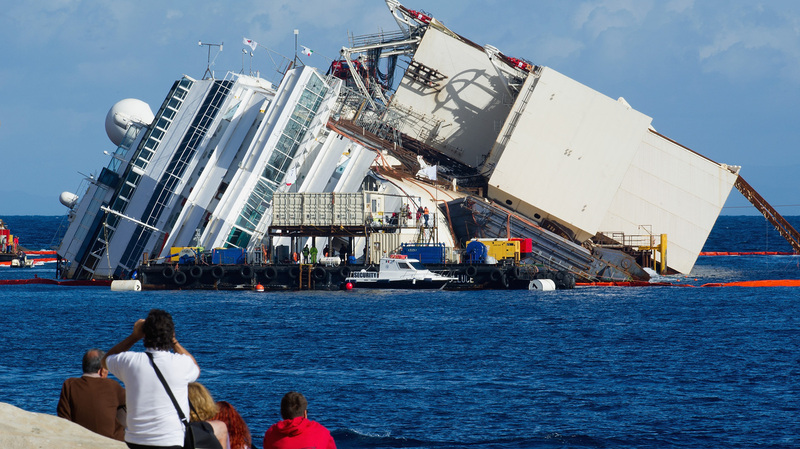 How To Watch As The Costa Concordia Is (Hopefully) Righted : The Two-Way The cruise ship ran aground and slumped over on its starboard side off the coast of Tuscany in January 2012. Thirty-two people died. The effort to pull it upright is said to be the biggest such operation ever. At 114,000 tons, the ship is twice the size of the Titanic. The view Monday from shore as work began to pull the Costa Concordia upright. The box-like structure on the ship's port side is one of the refloating caissons that will stabilize the ship. The effort to shift the luxury cruise ship Consta Concordia into an upright position has begun, and several news outlets are streaming their coverage of what's said to be the biggest such operation of its kind ever. Reuters is one good option. It has embedded its video feed in its live blogging of the operation. The BBC's webcast, meanwhile, has the advantage of allowing you to mute the sound. It was January 2012 when the ship ran aground off the coast of Tuscany. Thirty-two people died. Two bodies may still be aboard the ship. As NPR's Sylvia Poggioli explained for us on Saturday, "the old nautical term for the operation is called parbuckling. Over a 10- to 12-hour period, the ship — now slumped on its side on a sloping reef — will be slowly rotated as dozens of pulleys will pull it upright." At 114,000 tons, the ship is twice the size of the Titanic. "The parbuckling or rotation will take about a couple of days, as the movement has to be extremely delicate and constantly monitored. "The parbuckling will be performed using strand jacks which will be tightening several cables attached to the top of the caissons and to the platforms, which will be pulled seawards, while the cables attached to the starboard turrets will be used for balancing. "This is a very delicate phase, during which the forces involved have to be offset carefully to rotate the wreck without deforming the hull."